Homeless haven is a concept designed to solve the increasing concern of homeless in the process of urbanization. In summer time, you probably will notice more and more homeless live in the street, wandering from place to place. To give them more humanitarian care and assistance, designer Ke Wan, Xiaohua Ma, Xing Guo & Qingxiang Zhu come up with the idea “Homeless Haven”. 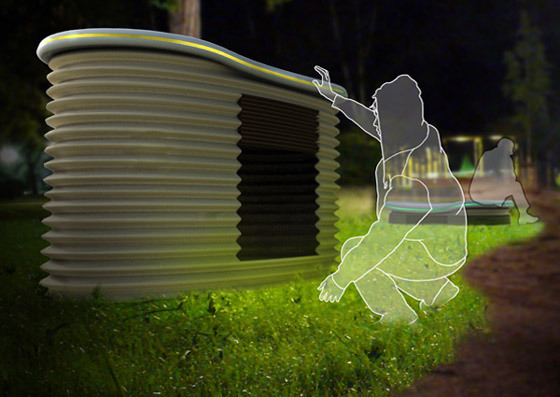 It looks like a bench for public to rest during the day and can be converted into a safe shelter at night. It might look like a good idea but if you think thoroughly, there are many problems if this “Homeless Haven” actually be used in public area. How to keep the shelter clean? How to make sure these shelter won’t be used in day time and converted back to bench?